Custom Oak Camo Frame Wrap Sunglasses are good for the promotions of sports and adventure brands, safari parks and also clothing brands for promoting specific product collections. These custom party sunglasses are featuring amber lenses, Oak camo frame wrap and also 100% UV protection. The 1/2" W x 1/4" H imprint space on the lens gives your brand the best exposure it needs to develop a good brand identity. 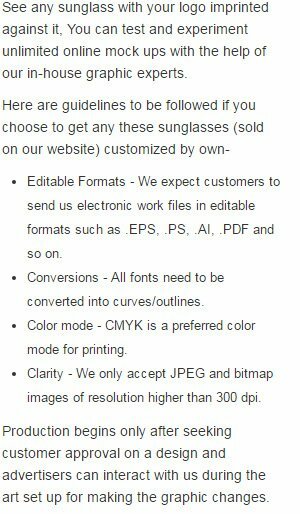 Order these custom sunglasses today and win our free artwork design and free online proofs facilities. Request a quote to know wholesale savings for these Custom Oak Camo Frame Wrap Sunglasses.